In addition to high quality Medical ID bracelets or tags we include a complimentary wallet Medical ID emergency Card. You will fill it with medical information critical to your condition. Some medical information is difficult to remember by heart. The Medical ID emerg ency card together with Medic Alert jewelry will provide the health provider with a better picture about your medical condition, which will result in a more successful treatment. 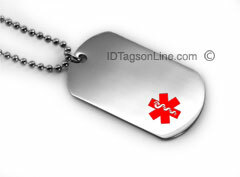 There are many stores which are selling medical Id bracelets and medic alert Dog Tags. What makes our medical ID bracelets different from others? First of all we use traditional deep groove engraving of information on ID plate. This makes it virtually impossible to wear for life. Second, our Medical ID bracelets and Dog Tags are polished to mirror finish. This creates exceptional contrast of letters and makes it very clear for reading. Medical personal appreciates this quality very well. Third, we spend a great effort to pay attention to the little details and address your direct requests. We are flexible enough to make modifications of our medical ID jewelry to give you more comfort and piece in mind. We always listen your suggestions about Medical ID tags and bring new products to satisfy different needs. We are looking forward for you to became our customer. Thanks again for visiting our medical ID jewelry store. Why do we use Medical ID bracelets and tags? There are many reasons why people are using medical ID bracelets. For someone it could be an allergy, for the another a condition like diabetes, seizures or heart problem. In either case your medical ID bracelet will "speak" for you when you can't. It is known that in over 90% of emergency situations medical personnel look for an ID tag; more t han 75% check for a medical ID immediately upon assessing the patient. In an emergency, quick respond personnel need to know specifics of our health situation, what conditions we have, and what medications we take. Easy access to this information can be critical to saving our lives. Medical Alert bracelets, or other ID tags are the first aid for doctors and nurses to understand the situation and to avoid dangerous delays or mistreatments. There are a variety of medical ID tags available at our store to fit everyone's taste and budget. Each type of medical ID tag has its own number of lines you can order to engrave. We made our best efforts to provide our clients with high quality Medical ID bracelets and tags. They are made from premium grade stainless steel and sterling silver, which are known as clean and human body friendly materials. To provide dependable marking on our Medical ID bracelets plates we utilize modern technologies, such as computerized marking. We guarantee smooth edges and long lasting clear text, easy to read at different light conditions and circumstances. 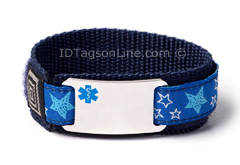 Medical support personal will be able to read and understand our ID bracelets and tags fast and accurate. We provide medical ID tags for adults and children. Our stainless steel ID jewelry is elegant and durable at the same time. It is lightweight and rustproof. 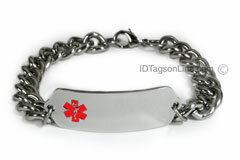 You can wear our stainless steel medical ID bracelets and tags any time, in any weather. It would not be damaged in the gym, swimming pool, shower or ocean water. Medical ID jewelry will never limit your or your children's activities. Sorry, we do not provide free medical id bracelets. Our beaded bracelets and sterling silver medical tags are made with jewelry quality and have to be treated as a jewelry. They may not be the best choice for patients or conditions where excessive force may be applied to the bracelets. How to choose right Medical Alert bracelets or tags. The choice for the right medical ID bracelet or Medic Alert jewelry depends on your personal preferences and amount of information you would like to place on Medical ID plate. To choose the proper size of Medical ID bracelets, please, refer to our guide lines outlined in the following document: "How to choose an appropriate length of the Medical ID Bracelets"
We are sensitive not only to the quality, but also to the cost of our jewelry. You will find our medical ID products affordable and reasonably priced. One detail that we have to mention. Many stores have a hidden cost for engraving, shipment and even attaching a medical ID symbol. This can be learned only at the completion of their order. These "additions" may easily increase the advertised price of Medical ID jewelry by $10-$15. We routinely make such analysis of the Medical ID market to be sure that prices for our Medical Alert Tags are attractive and favorable for customers. What to engrave on Medical ID tags? Most people choose our medical ID bracelets and Medical Alert jewelry to protect themselves or loved one in case of emergency and have some peace in mind. So, text for an engraving on Medical ID tag will depend on most important factors, which may affect you. he majority of Medical ID tags are limited by five lines. There are larger Medical ID tags with 10 lines and double sided Medical ID Dog Tags, which have from 12 to 18 lines of medical information. Again fill free to have your own idea what you would like to place on Medical ID bracelets or tag. Just keep in mind number of available lines and number of characters in the line.